This is a CD produced by a guy named Kenny from Mountain View, CA and some of his quite talented music buddies! The CD is split into 4 parts: Overture, Act 1-Below, Act 2-Rising, and Finale, with Act 1 and 2 containing four parts. The opening track "Mantra" is great. "It is time to change your Mantra before it becomes a monster and takes a bite out of your soul. Think about!". A funky tune with a good sense of humor and good playing that includes sax, turntable, guitars, etc. "Soul of David" opens act 1 and is a heavy funky thing, reminds me of a mixture of Mr. Bungle, Hieronymous Firebrain, and Psychofunkapus and Kenny. "Habit" is a very emotional and personal piece of music. Great song. "Forever" starts Act Two and is a great piece of music with interesting percussion, guitars, excellent clarinet and a good funky driving rhythm. "Push" is another stand out track with the heavy guitar and again reminding me of Hieronymous Firebrain. I really like the production quality of this CD. You can really hear everything very clearly and in just the right proportions. A great variety of material, from heavy guitars and funky stuff to acoustic and soft, emotional numbers. Excellent! 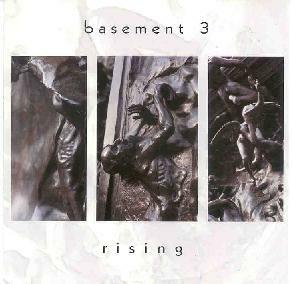 For more information you can visit the Basement 3 website at: http://www.basement3.com. Contact via snail mail c/o Basement 3; 2682 St. Giles Ct.; Mountain View, CA 94040.